Someone researching Presbyterians in Lichfield had emailed me with an extract from the Victoria County History asking if I knew anything about any of the buildings mentioned in it. It was the mention of a chapel in Longdon Green which caught my attention but the only one I really knew anything about was the school which once stood at the corner of Bore Street and St John Street and was built in 1670 by Presbyterian mercer Thomas Minors for 30 poor boys in the city to be taught, without charge, until they were able to read chapters in the Bible. What I didn’t know anything about was the controversy it caused at the start of the 20th century. At a Lichfield City Council meeting in March 1902, the Streets and Highways committee recommended that the Council should pull down Minors House (an alternative name for the school building), take what land was required to widen St John Street and sell the remainder. The property, consisting of Minors House, a warehouse, and shop plus three adjoining cottages, had been purchased by the Council in April 1900 for the sum of £1,680 from the representatives of Mrs Sarah Cooper (deceased) with a view to widening the corner of Bore Street. However, only the schoolroom end of the building was demolished and later that year, councillors discussed what should be done with the remainder. Cllr Raby was keen to ensure that the property was sold under the most advantageous terms so that the Council could recoup the cost of the road improvement to as great an extent as possible. Cllr Wood asked about the strip of land where the schoolroom had once stood, as in a previous meeting it had been decided that it should not be included in the sale and Cllr Andrews thought it unwise to offer the property without the land. Cllr Raby questioned whether one of the most valuable business corners of the City should be turned into a shrubbery or flower garden or some other unprofitable experiment as the improvement had been carried out at great expense to ratepayers and it would be wise to seek to make the best of the property. 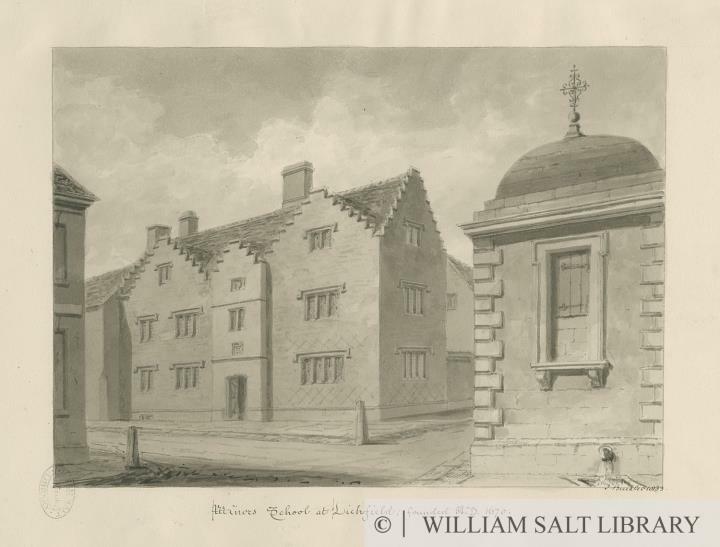 He also said that it was hardly to be expected that in the future the Minors School, which had been half pulled down, could be retained in its present ugly and unsightly state and the purchaser of the property ought to have sufficient space allowed him and a free hand to erect something which would be an ornament to the city. I have seen the plans submitted by the present owner of this property and I find that, broadly, they mean the complete transformation of this old building – the demolition of many of the rooms, and the utter desecration of the facade of the building and the placing of a tawdry shop front in its stead. Cllr Raby urged his peers to protest against ‘wanton vandalism of this kind’ but not all those present were convinced. Cllr J.R. Deacon queried that given the building had been the property of the council who had sold it, it ‘could not have been thought of very great value, or it would not have been disposed of’. The Town Clerk urged caution, stating he was not against Cllr Raby’s resolution but that he did not think any good would come of it. In his opinion, the time to raise the question of the preservation of the building was at the when the property was sold, and given that the plans submitted by the new owner complied with the bye-laws, the Council were bound to pass them. Cllr Jones was also sceptical and commented that he believed the building had been spoiled when the schoolroom was demolished years ago and considered it too late to be talking about preserving an ancient fabric now. Alderman Andrews was keen to ensure that the new owner of the building, a clothier called Mr F M Tayler, was treated fairly. Despite these concerns, the amendment was carried with four members voting against. In answer to your enquiry re Am I willing to place a purchase price on Minors’ House?, I regret that under the circumstances I cannot, as the lease of tenancy of my present business is drawing to a close. Having purchased Minors’ House with the definite purpose of converting the same into business premises for my own use, I cannot in justice to myself and my family, consent to sell. I certainly thought that your Council placed no historic value on this property, for did they not themselves destroy that portion of the said building which was in reality the key for which it was originally built, and after, placed the remainder upon the market without any restrictions, thus closing its historical career? Fast forward to November 1954. F M Tayler is now an Alderman on whom the Freedom of the City is about to be conferred and a Lichfield Mercury column called ‘Round and About’ looks back to the controversy surrounding Minors House. Apparently, hanging on the wall in Alderman Tayler’s house at the time was a large metal key and wooden bolt which belonged to a Norman oak door from the Minors School, which had been offered to the council for the city’s museum. Presumably it never ended up there as the columnist was trying to track it down and was told by Mr Birch the solicitor that it might be the one in the old Friary wall on St John Street, which ran around his property, as the council had put it there about 20 years ago and he didn’t know where it came from. With nothing but this circumstantial evidence to go on, the columnist asked if anyone could throw any further light on this. Now, I only have a dark and grainy picture of the door and I am no expert in Norman carpentry but I’m sure that this is not the door we are looking for. If you know where to look, traces of Minors House can still be found. One of the steeped gables from the original 17th century building remains and I am sure that I have seen masonry from the porch in the museum at St Mary’s. However, door to door enquiries about where that ancient bit of oak ended up are continuing.